Thanks for a very comprehensive summary. The basis of their OP rating is interesting: I can only assume that the unavailable oscillator for the OP is actually the Oscilloquartz 8607. This was available in performance selected versions which might relate to their 16 and 17 levels. The reason for the demise of this crystal is the difficulty of getting good yields. In simple terms, all components in the oscillator including the suspension are made from slices of the same crystal, removing any thermal or mechanical discontinuities which would affect performance. The new owners of Oscilloquartz felt that the complexity and yield are no longer commercially viable. As mentioned, some alternative structures are in development and might appear. Remember though that the Audio market is not a significant customer for such products so it is not really in a position to drive the market. Cost is certainly going to be an issue too. Given the near $40k price for the discontinued Sforzato clock which used the 8607. The 8607 certainly gives the "wow" factor, so I hope that alternatives at similar performance emerge before too long. Great points and feedback; thank you! Look up Rakon HSO14 -120dbc/1hz which is an equivalent of the BVA8607. I may have an OP20-enabled clock here next year at some point. *Reminder: Bring up in Google Chrome and elect automatic translation from Japanese. I have one in my rig for testing so I know they build them; give it some time (don't know how much). I've read all 200 + posts and realize a lot of discussion on clocks and some regarding clock cables (BNC or RCA, 50 or 75 ohm). Let me tell you, I'm a firm believer. 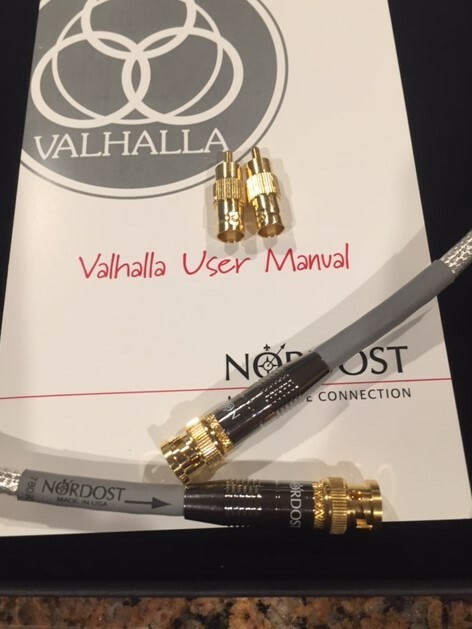 Received these today -- at $2K for 1 meter and I need 3; well, that about taps me out & there is no way I could afford or would be willing to spend $12K per on a 1M Nordost Odin 2. I'll expand a bit on my experiences going from a run of the mill 75 ohm BNC to these puppies a bit later. (Contacted Martin at dCS HQ & he confirmed 1 meter 75 ohm is the ticket for the Paganini 4 box). For now, I'll just in this thread since the other one is already corrupted. Last edited by vintage_tube; 08-12-2017 at 06:27 PM. For cybershaft spécialiste. Wyatt about calibration ? JPS, what is your question? I do not understand your post?